Moses Goods is one of Hawaiʻi’s most prominent theatre artists. Originally from the island of Maui and now based in Honolulu he has traveled nationally and internationally performing his original work to a wide range of audiences. 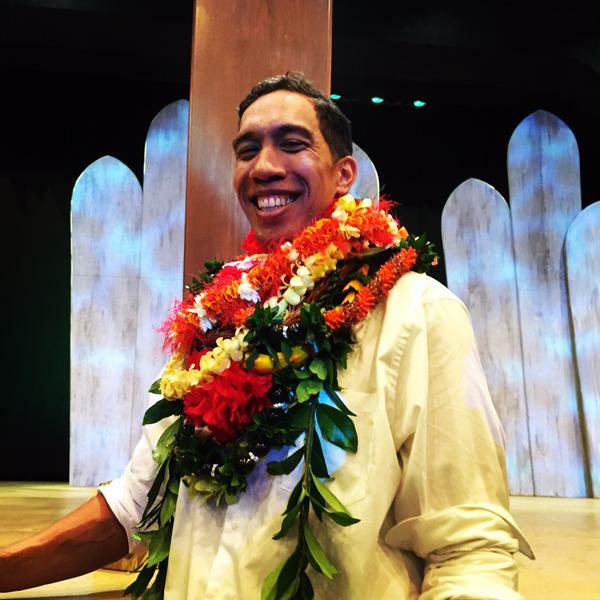 His body of work ranges from full length plays to theatrical storytelling pieces most of which are strongly rooted in Native Hawaiian culture. Currently his one-man show DUKE is touring throughout the Hawaiian Islands as well as the Continental U.S. Originally produced by Honolulu Theatre for Youth, DUKE is an unforgettable portrayal the life of Olympic gold medalist and father of modern surfing Duke Paoa Kahanamoku. Moses is also the founder and artistic director of ʻInamona Theatre Company, an organization dedicated to reintroducing the native stories of Hawaiʻi to the community. ʻInamona is a traditional Hawaiian relish made from the roasted kernel of the kukui (candlenut). It is sprinkled sparingly over mea ʻai (nourishing food) to gently enhance the natural flavor. Moses believes that no matter how skilled the storyteller, his (or her) work is merely a condiment to the greater sustenance. The true “mea ʻai” are the stories that have come before us, the stories of our ancestors.